We are in love with our new look. Truth be told though, the packaging transition was gnarly and hard! It upset some customers and it took too much of our time and focus. So we are really glad to finally be on the other side and taking a moment to reflect. To put it in context, we launched a new online gift business this month, a new website last month, and a new brand look last year. We also have been undergoing a complete renovation of our inner workings, our supply chain and doubling down on mission. It’s all part of a vision. Our brand and packaging are part of a drive to give customers more reasons to feel good about eating bread. Great eating, better nutrition, interesting flavors, beautiful visuals. Greener, more sustainable practices and more social impact. Our Bread Breakers conversations, which are being recorded in the Library of Congress through StoryCorps, are very much like our new packaging. We are experimenting and pushing. Some things work, some don’t. It’s hard but worth the effort. We knew the transition would be challenging and despite intense planning and focus, we stumbled on many unexpected roadblocks as well as ones we thought we had under control. Our product line is large and we had many different printers working in parallel on varying shapes and packaging formats. In our efforts to both satisfy our buyers’ insistence on window packaging and also improve the sustainability of the packaging and deliver it at a manageable price point, we had some bags that failed at retail. Ripping bags were a nightmare. We also discovered that what looked fabulous on the design boards wasn’t clear enough on the shelf. We had to make changes to some of our color block structures and also to our typography. New plates! New runs! Agonizing delays. Shipping resupplies to customers. Asking for forgiveness. And finally, we had a hard time communicating the transition. Some of our super loyal Chabaso fans are still not sure that this is the same brand! On the other hand, the new look and packaging opened many doors and helped us sell into new markets and get acceptance of our newer formulations. We are expanding. It’s hard to make everyone happy all at once. One by one, we are working through the remaining in-market issues. The photo below is from one of my many store visits to talk with people who are in the trenches. The folks at retail are a smart, tough crowd and they know their stuff. In this shot I was at my local Big Y just before Thanksgiving. 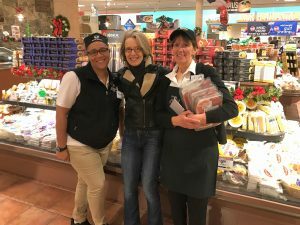 I’m with the Deli and Cheese Department Managers. They love the new look and forgave us for some of the challenges of getting it all settled out. Thank goodness for our loyal friends in the marketplace! Why did we make the change? It is brighter and more edible. Helps us stand out. It’s bolder, cleaner, and forward looking. With typography, color design and materials, it communicates our high-quality, healthy, really-special natural food that is a cut above the rest. It’s always about great bread of course, but also about health, sustainability, looking forward, building community and having a positive impact. 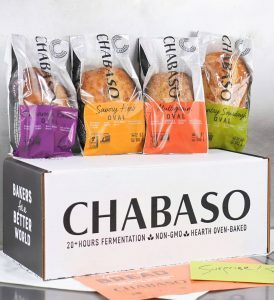 There is never enough “real estate” to tell the whole story on any package, so we rely on the look and feel and of course, the actual experience of people eating our bread. We know that once we get trial we get loyalty. Getting the package off the shelf, for any product, is the big challenge. Transparency is also an important value to us and our new packaging literally shows more of our bread. We designed the packaging to be easier to find and easier to remember. And we have given our customers visual clues to the general category of flavor or formulation they might be looking for. Traditional is green. Savory is mustard. Slightly sweet (we are never about sugar) is violet. Seeds and grains are orange. Performance is also critical, we redesigned our bags to keep the bread better for longer. This is not only convenient for consumers, but it makes a real impact on food waste which runs really high in perishable products. It’s a big issue and mostly unseen by consumers. The design and materials of our new bags, including the fold down, really helps the shelf life by as much as a couple days. I could go on. Packaging is such an interesting topic. So is the challenge of selling in the artisan bread category. It’s not for the faint of heart!